Tarragon Chicken Salad | Mary Duke Cooks! Many years on Easter mother would prepare a cold meal that would be ready as soon as we got home from church. That way we would eat lunch before we devoured our candy! She would have Ham, rolls, chicken salad, potato salad, coleslaw and deviled eggs. 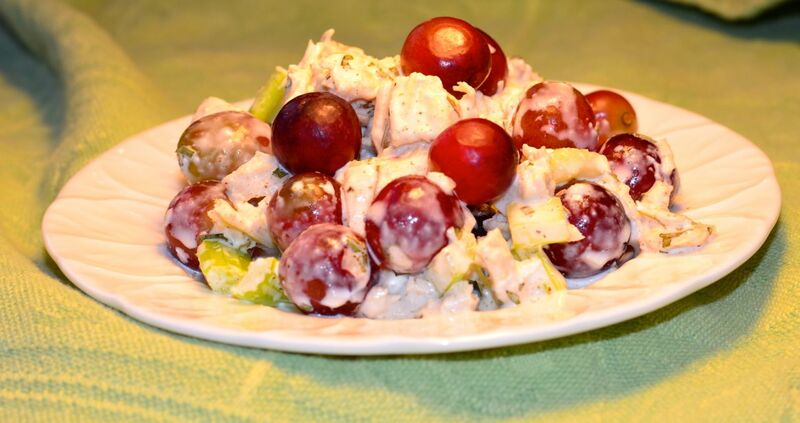 Here is one of my favorite recipes for chicken salad. In a large pot place chicken, halved celery stalks, and onion. Cover chicken with water. Bring to a boil then reduce heat to simmer until chicken is cooked through. Cut chicken into large chunks, return to pot , cover with lid and refrigerate overnight. The next day remove chicken from pot. Discard celery, onion and water. Cut chicken into 1/2 inch cubes. Add diced celery, grapes, mayonnaise, tarragon, pepper, and celery salt. Stir to combine. Refrigerate before serving to let the flavors mingle Enjoy!